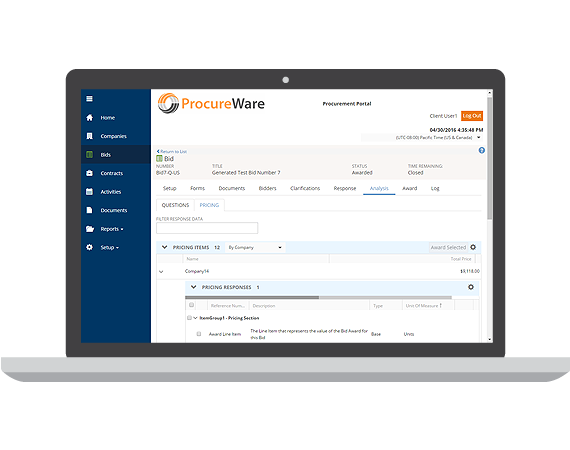 ProcureWare is a flexible tool for managing the sourcing lifecycle, from supplier selection and pre-qualification through online bidding, analysis, and award. 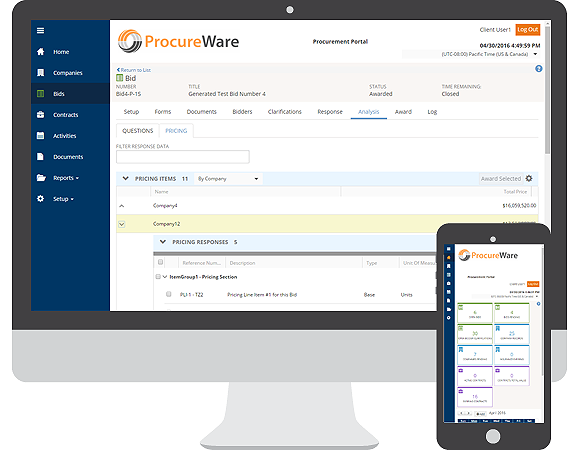 With tools powerful enough for the procurement professional yet simple enough for the casual user, the time has come to move beyond email and spreadsheets to efficiently engage suppliers in competitive bidding events to drive down costs and diversify the supply chain. Routinely save weeks in the requisition to award cycle to complete the procurement of goods and services. Funnel supplier requests for clarification on your requirements through the website. Answer once and distribute responses to all sourcing event participants. Leverage the flexibility of configurable templates for managing different types of sourcing events for materials or services using structured question and pricing responses. Commission a team of evaluators to independently score supplier responses to create a defensible process for ranking supplier bids and proposals. Use sealed bidding functions to ensure an unbiased, auditable and transparent evaluation and award process. Technical and pricing responses can be opened in a single-step or two-step process. With automated bid tabulation features, eliminate math errors that plague working with spreadsheets and quickly evaluate alternative, multiple award scenarios to one or more suppliers. Use historical bid and award information to establish projected costs and measure actual savings for each sourcing event.